The Radcoflex constant support system has a mathematically perfect design which ensures that the pipe will have continuous controlled support through its entire deflection range. The supporting mechanism comprises a coil spring connected to a centrally pivoted lever by tension rods. The load is attached to the other end of the lever by a hanger rod. The force of the load acting at one end of the lever creates a turning moment produced by the spring force acting at the other end of the lever.The Radcoflex constant support is designed so that these moments are always equal and opposite. Constant hangers are made in two basic designs – Figure 81H (Horizontal design) and the figure 80V (Vertical design). Combined, the 81H and 80V constant supports are made in 110 different sizes to accommodate travels from 40 to 500mm and loads from 0.12 to 403.5 KN. • Because of exclusive geometric design, mathematically perfect constancy of support is maintained throughout the full range of travel. • Compactness – the provision of horizontal & vertical configuration minimizes installation space. • Each support is individually calibrated to the customer's specified load. • All constant support have a wide range of load adjustability. • Provision for hanger rod to swing up to 6° from the vertical. • Type A support is designed for attaching to a structural member by screwing two rods into tapped holes in the top of the frame of the support. • Type C is furnished with four lugs, one pair of lugs at each end of frame of the support. These lugs permit the attachment of the support to the building structure. • Type D may be bolted directly under structural steel. • Type E enables the support to be bolted on top of the structural steel. • Type A supports is designed for attachment to a structural member by screwing a rod into a tapped hole in the top cap. Sight holes are provided near the top of the casing to allow visible inspection for correct thread engagement of upper hanger rod. • Type B is furnished with a single lug for attachment to the building structure. The lug permits use of welded beam attachment, clevis or a pair of angles for attachment. • Type C is furnished with a pair of lugs for attachment to the building structure. These lugs permit the use of a structural welded lug, eye rods. • Type D rests on the top flange of structural steel while most of the constant support itself hangs between or below the supporting beams. • Type E rests on the top flange of structural steel and the constant support is entirely above the supporting beams. • Type F is the support of piping or equipment from below. It has a base flange for fastening to the floor or to beams. The load arm is furnished with a removal load pin. Sway strut may be used to connect the support to the load. The strut should be ordered separately. • Type G is a complete trapeze assembly. 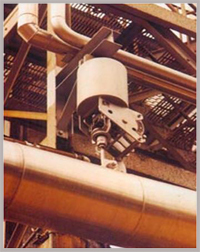 This consists of two vertical type constant support units plus a pair of channels, back-to- back, welded at each end to the casings of the supports.